Road Safety Scotland’s primary concern is the safety of all road users. We provide advice and guidance for drivers, cyclists, motorcyclists, pedestrians and horse-riders, as well as teaching notes and class activities for educational professionals. On this website, you will find education tools, road safety guidance and publicity materials. You can download specific publications, audio, and video clips by searching our resource database. 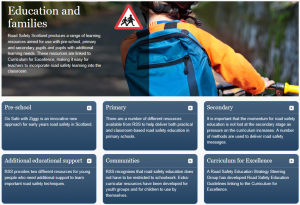 Our remit is to develop and co-ordinate Scotland-wide road safety initiatives and campaigns.